As the large dark bird glides by overhead, you swing your shotgun, tug the trigger and a crow tumbles from the sky. It’s followed by a small cloud of feathers gently floating down. There’s no time to relax or look around because more noisy cawing crows are swarming overhead at your location. When you properly prepare and hunt crows, the hunting can be very fast-paced and provide many shooting opportunities. Along with the thrills comes the satisfaction of knowing you have mastered hunting skills to include camouflage and marksmanship. Crows are widespread and well-known because they inflict damage on garden crops, peck holes in orchard fruits, and they pilfer farm cash crops from coast to coast. Annoying crows also raid the nests of smaller songbirds and the popular wild turkey where crows destroy and eat eggs. Hunting crows can help you become a better wingshooter, plus the preparation teaches valuable hunting lessons in scouting, camouflage, calling, strategy development and oftentimes can help improve your skills in landowner relations. Crows can also be used to train bird hunting dogs. Need any more reasons to gear up and go get ’em? 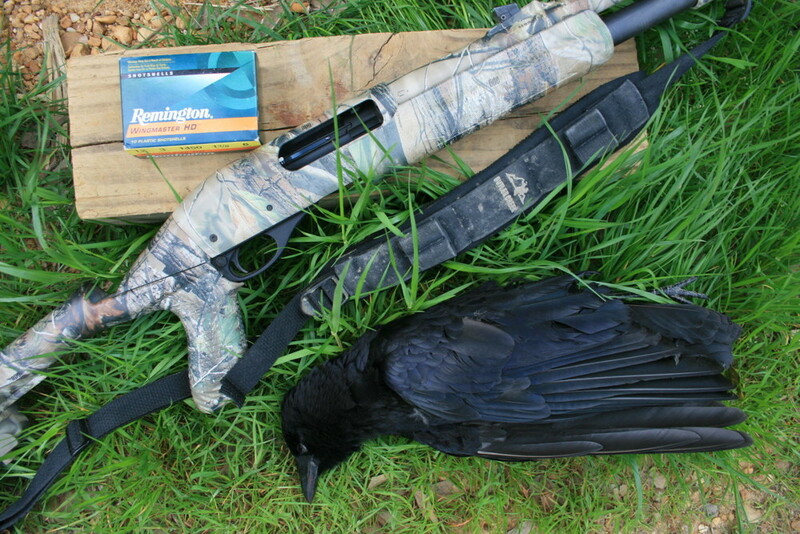 Before your fire the first shotshell, take note that crows are very durable birds. Consider No. 6 shot as the minimum size shot. If you want to make hunting these pests a long-range rifle game, bolt-action rifles in calibers such as .22-250 Rem., .223 Rem. and .204 Ruger work well. Ruger, Remington, Savage Arms, Browning, Weatherby, Thompson/Center, Smith & Wesson and Winchester all offer rifles in the best calibers. Plan to top your rifle with big magnification scopes of 10X, 12X or higher power from manufacturers such as Zeiss, Leupold or Redfield. To properly prepare to down a murder (the name for a group of crows), you should camouflage everything, especially your hands, face and firearm. Note that the natural skin oils on your face can reflect light and shine to alert incoming crows, so wear a headnet. To conceal your position, use tree branches, weeds, grass and other surrounding vegetation to cover gear much like when you go on a goose or duck hunt. For more tips on blending in, visit www.realtree.com. There are two methods to make crows hunt you—the hand-held mouth blown calls and the push-button electronic calls. The good news is that electronic callers permit you to actively hunt and focus less on creating the right volume, rhythm and tone. An electronic call, however, will lighten your wallet by $100 or more. A quality mouth-blown crow call will cost about $10. Crows also pursue hawks and owls, so use those bird’s calls to bring a crow near or to simulate a fight between crows and the larger birds. A noisy fight is something no crow can resist. When selecting a call and best calling method, note that the more loud ruckus and racket you can make, the more likely that crows will come to investigate—or join in. Crows love a fight and are boisterous when they gang up on hawks and owls, especially when one of those bigger birds has latched onto a crow. Consider deploying a hawk or owl decoy along with crow decoys. Most hunting gear outlets sell both types. One final note: be prepared to shoot before you emit that first crow call. A crow could be lurking nearby and watching you.